May 12, 2016 – A team led by Southwest Research Institute (SwRI) has made the first direct detection of the source of magnetic reconnection. Analyzing data from NASA’s Magnetospheric Multiscale (MMS) mission, scientists have observed how this explosive physical process converts stored magnetic energy into kinetic energy and heat. In late summer 2015, the four identically instrumented MMS spacecraft began to survey the magnetopause. In this boundary between the solar wind and Earth’s magnetosphere, the scientists are searching for locations where the solar wind magnetic field and the terrestrial magnetic field reconnect. 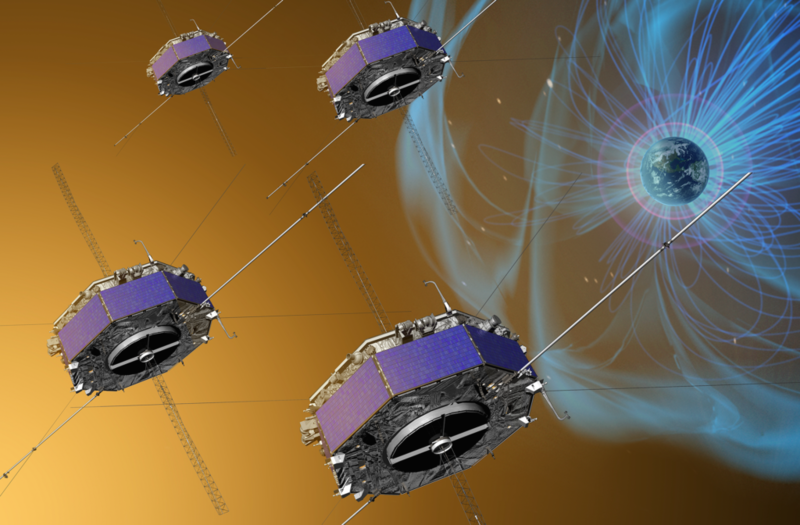 In half of the over 4,000 magnetopause encounters, MMS has seen evidence of reconnection, but most often the spacecraft did not pass through the reconnection sites themselves. Then on October 16, 2015, MMS flew through the heart of a reconnection region. MMS measures plasmas, hot ionized gases consisting of approximately equal numbers of positively charged ions and negatively charged electrons. The solar wind and Earth’s magnetospheric plasmas are both magnetized. For reconnection to occur, the plasmas become “demagnetized” — that is, the plasma and the magnetic field become decoupled. The critical and final stage in this process occurs in a relatively small region in space known as the “electron dissipation region.” As the electrons become demagnetized, the magnetic fields of the Sun and the Earth interconnect and the solar wind and magnetospheric plasmas mix. Magnetic reconnection — which occurs in both natural plasma environments and laboratory plasma and fusion experiments — is at the heart of space weather. Reconnection is responsible for explosive solar events, such as solar flares and coronal mass ejections, and drives disturbances in Earth’s space environment. Such disturbances produce spectacular auroras, but can also shut down electrical power grids and disrupt satellite-based communication and navigation systems. Another feature observed for the first time by MMS as it traversed the dissipation region was a rapid change in the electrons as they streamed into the dissipation region and were accelerated outward along field lines opened during reconnection. This observation was the first definitive measurement of the interconnection of the solar and terrestrial magnetic fields. These discoveries — which have significant implications for space and solar physics, astrophysics, and fundamental plasma physics — will be published in the May 12 online issue of Science. MMS is the fourth NASA Solar Terrestrial Probes Program mission. Goddard Space Flight Center built, integrated, and tested the four MMS spacecraft and is responsible for overall mission management and mission operations. The principal investigator for the MMS instrument suite science team is based at SwRI in San Antonio, Texas. Science operations planning and instrument commanding are performed at the MMS Science Operations Center at the University of Colorado’s Laboratory for Atmospheric and Space Physics in Boulder.